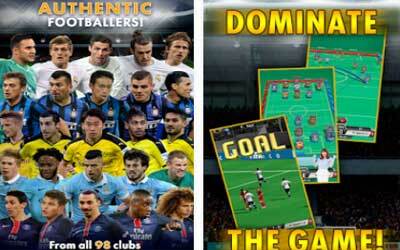 Fans of soccer will definitely want FIFA Soccer: Prime Stars APK 1.2.1. With the latest technology and specs, the better soccer game for your Android device is finally here within your grasp. As the compact game of the well-known FIFA series, you will play an unforgettable and fun soccer game in one convenient location. Compared to the previous soccer games on the Android device, this game will bring a better soccer gaming experience closer to the realistic level. Clearly, this soccer simulation game is a very hot game for avid soccer fans with tons of fun and surprise up to its sleeve. This FIFA game is indeed a touch of the future and the past. Instead of the customized soccer gameplay many games pose, this game will take you back to the more-realistic simulation, similar to the FIFA games on the consoles. For starts, you have the liberty to choose every football team that has been updated to 2016. Keeping the simulation sensation realistic, there are plenty of modes to choose: Challenge, Scouting, Training, and Management. The main menu, League Mode, will toss you in five worldwide leagues such as Premier League (England), Bundesliga (Germany), Liga Espanola (Spain), Ligue 1 (France), and Serie A (Italy). Keeping the experience real and exciting, you can play as the players and also the coach. This FIFA game will demand you, as the coach, to build your own dream team by buying and selling players all around the world. Make your own dream team by choosing many different players that have different and unique skills and characteristics. To enhance every player’s performance, Training Mode will help you in doing that. Of course, playing the football directly is the main part of the fun. By utilizing amazing tactics and players, you will win the match and bring closer to the Champion title. As mentioned before, FIFA Soccer: Prime Stars for Android is a must-have game for avid football fans. CHALLENGE MODE – Customize your players by giving them new skills won in Challenges. SCOUTING – Scout your favorite players and build your dream squad. TRAINING – Train and power up your players. MANAGEMENT – Manage team formations and strategies to give your team the best chance to win matches. 3D match mode – takes you into the game for the full experience.